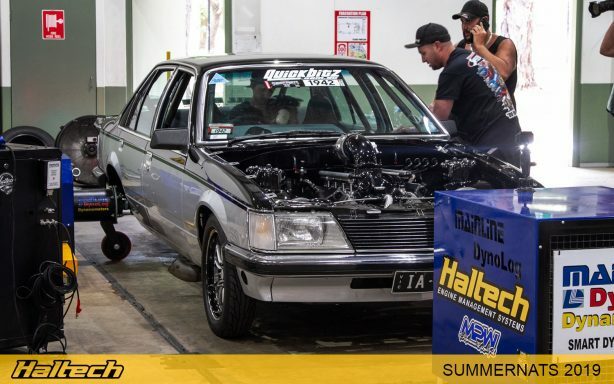 The Summernats Haltech Horsepower Heroes competition was given a fair shake-up for 2019 which saw Adam Rogash and his crew from MPW bolting vehicles up to a Mainline hun dyno, instead of the more traditional roller (chassis) dyno. 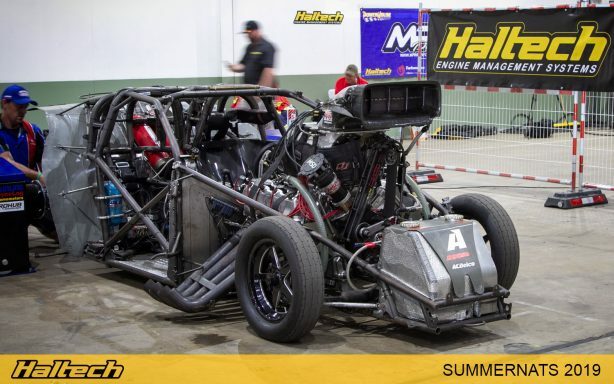 The change brought some huge horsepower heavyweights to the show which made for a killer atmosphere in the dyno cell – much power was made, and many eardrums copped a pounding. 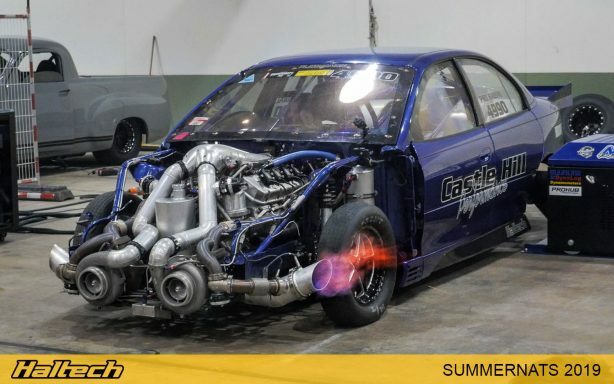 While the rest of the world is busy swapping LS engines into everything, Brenden ‘Bubba’ Medlyn has bucked the trend, sticking with a 398ci Holden-based, Torque Power “Little Paw” motor, methanol and a pair of big turbos. 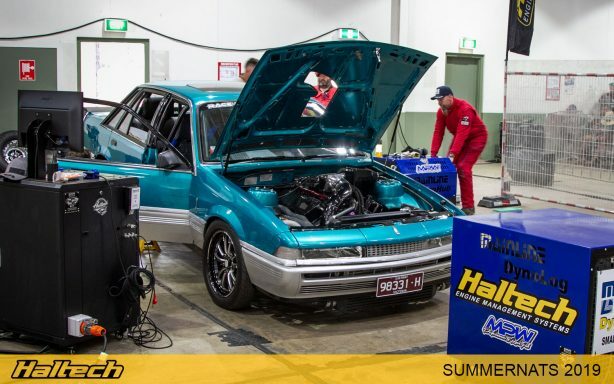 His faith in the Holden architecture paid off on Friday when his VH Commodore made 2261hp at the hubs, making him the top-qualifier for the Forced Induction Eight-Cylinder class. 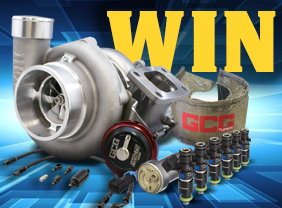 On Sunday, the 2016 Drag Challenge winner was back on the dyno with tuner Michael Kalaitzakis at QuickBitz on the phone. Michael remote linked to the Haltech Elite in the car and must have had his finger working overtime on the “page-up” button because the result was approximately 50psi of boost, and an astounding 2483hp at the hubs! Enough to win the class – and Horsepower Heroes overall. 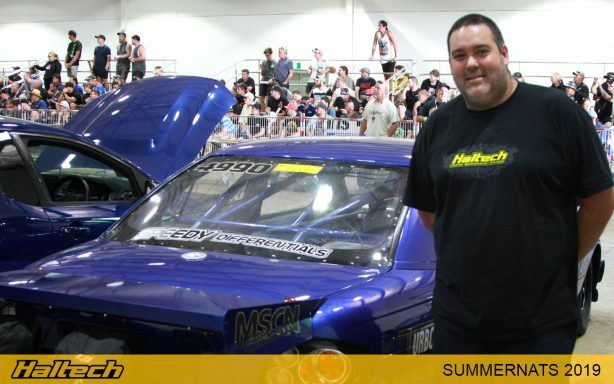 Greg South’s HQ was top qualifier for the Horsepower Heroes at Summernats last year, and back on the dyno again this year. The Haltech-powered big red sedan pulled an impressive 1304hp in qualifying, before Greg leaned on it a bit more on Sunday, pushing up to 26psi and 1350hp in the finals. Sitting the HQ smartly in third place in the Forced Induction Eight-Cylinder class. Brendan Cherry’s VL Calais had a hard time getting a clean dyno pull all weekend. Difficulties which were exacerbated thanks to the correct spare spark plugs not being available anywhere in Canberra. Still, the teal Commodore qualified with 1351hp on Friday, then Frank Gonzalez from Allsparks tweaked the tune for Sunday, finishing with 1469hp and second place in Forced Induction Eight-Cylinder. Frank also brought along this unassuming looking FG ute, belonging to one of Allsparks’ customer’s. 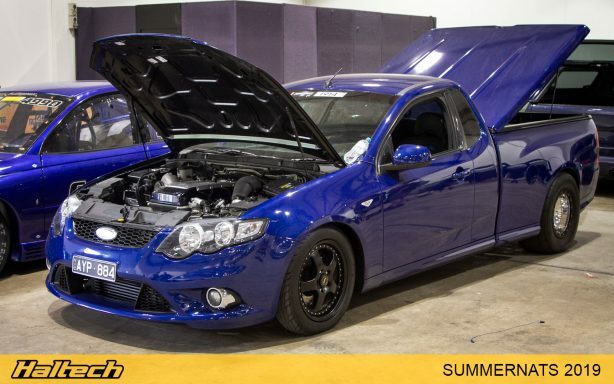 Residing under the bonnet is a forged-version of Ford’s mighty Barra inline six, alongside a Haltech Elite-Pro Plugin ECU and Garrett GTX45 turbo. The E85-swilling brute made 1112hp on 29psi to take out the Forced-Induction Six-Cylinder class. Much of the excitement in the dyno cell was created by the exhibition Turbo VS Blower shootout, between Maurice Fabietti’s AC Delco supercharged Monaro Pro Doorslammer and the Castle Hill Performance turbo big block Commodore drag car of pro Haltech “page-up” pusher, Dale Heiler. Due to the exhibition nature of the shootout, neither car was eligible to win the Haltech Horsepower Heroes, however that didn’t stop either team from digging deep and giving it their all. The battle was fierce, mind-bendingly loud, and insanely close – with only a handful of digits separating the two big hitters all weekend. 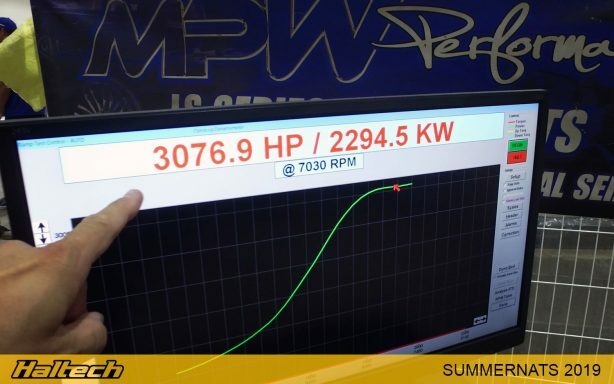 However, on Sunday, it was Dale’s turbo commodore that came out on top with a massive 3076.9hp! 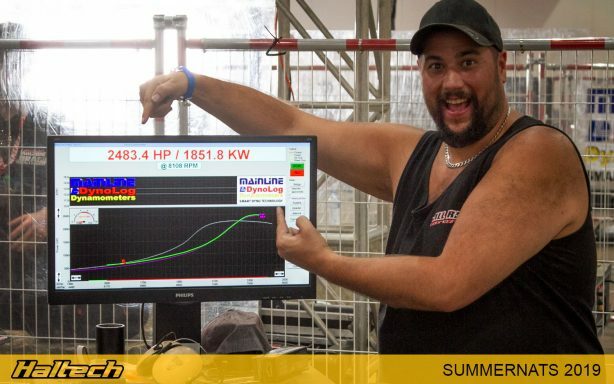 Not only did Dale take the win, but his Elite-powered blue bruiser was also the first, and to date only, car to break the 3000hp barrier on a Summernats dyno. A huge effort by Dale and the Castle Hill team! 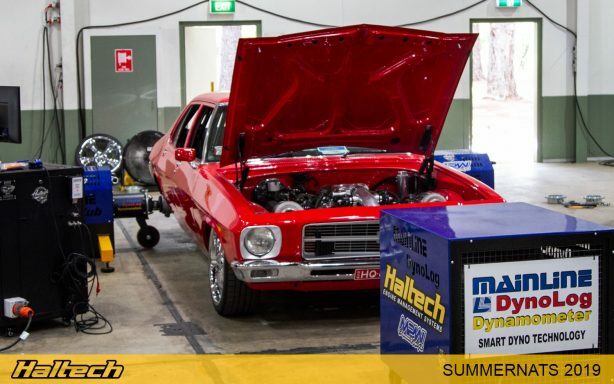 The rejuvenated dyno comp really energised this year’s Summernats, so much so, that we’re we’re already looking forward to the Haltech Horsepower Heroes competition at Summernats 33 in January 2020!